I love pancakes for breakfast on a weekend. So here I am today with my Chiaseed Happy Pancakes. Soft and fluffy with a big smile to brighten up your day! Combine the dry ingredients (except for the cocoa) in a bowl - Almond meal, wholemeal flour, bicarb soda, cornflour and chiaseeds. Crack the egg in a measuring cup. Then add milk to make up to 1 cup. Add vinegar and honey and mix well (I used my baby Bamix). Transfer the liquid mixture in to the dry mix bowl and fold to just combine - do not mix. Let it sit for 3-5 minutes for the chiaseeds to absorb the moisture. Take 1 Tb of the mixture in to a separate bowl, add the cocoa powder and mix well. Heat a frying pan on medium low. 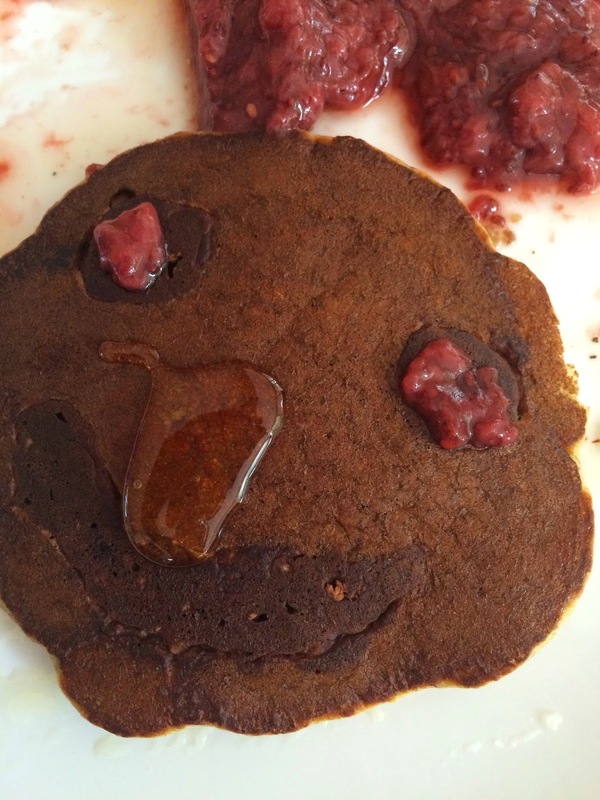 Using a spoon, drop the cocoa powder mix on the pan to make the smiley face (see photo below). Wait one breathe, then gently drop 2-3Tb of the pancake mixture on top of the face. Flip the pancake when 5-6 bubbles form and pop. Repeat for the rest of the batch. Serve with honey, jam, peanut butter or whatever your heart tells you to do! "Drawing" a smiley face on the pan. I had it with peanut butter and home-made strawberry chia jam. My family had fun drawing extras (honey = nose). My freezer's currently packed with omega-3 thanks to the frozen fish fillets (I buy a whole fish at the Fish Market then portion them out and freeze each fillet). Now my cupboard's also packed with omega-3 with these chia shots! Did I mention I also have a 1kg bag of chia seeds in the cupboard?